Black and white wedding cakes display their own elegance and sophistication. White wedding cakes have been common for years together and are still the most common choice. On the contrary, black was initially a forbidden color in weddings. However, it is now being gradually accepted in modern weddings. An entirely black cake is not favored; hence, normally black designs on white wedding cakes are preferred. There is innumerable variety of exquisite, sophisticated black designs on white cakes. Instead of white, some couples could choose ivory, silver or any other pastel color of their choice. A dark chocolate cake is also a preferred choice for those who do not want a total black look for their cake and also like chocolate. You can draw an elaborate black design on the brown cake. If a bride is very modern, it is likely that she would choose a black and white cake for wedding. She can even choose to have a brief black design on her wedding dress or add something black to the décor. However, she should make sure that the décor, bride cake or her dress is not entirely black and does not give the wedding a funeral tone. Black should instead set up a bold and beautiful look. 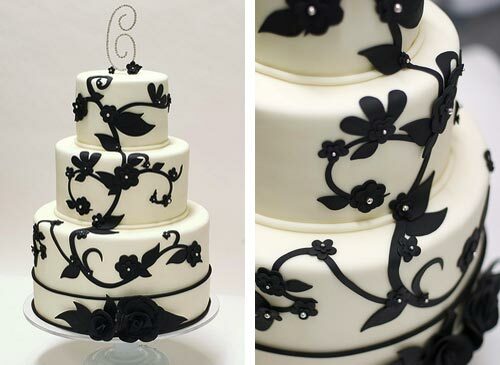 You could draw linear or floral black designs on the wedding cake. You could also use a bit of red color in the black and white wedding cake. It looks beautiful. You could draw lace designs in black or a satin ribbon design on the white cake. One more idea is to keep one tier in ivory and the other two in white color. Draw a black floral design sufficing all the three tiers of the bride cake. Black polka dots look absolutely stunning on a white cake. You could add a black and white cake topper to its charm. Decorating the black and white wedding cake with red roses also looks good. You can add some a bunch of roses on top of the cake while some surrounding the bridal cake on the table. It looks beautiful. You can have a black design of lines and diamonds on alternate white or ivory tiers. You can also have black and white cupcakes. This is if you opt to serve the guests with individual cupcakes. You can decorate these beautifully. Discuss with your baker regarding various possible options of a black and white bride cake to come up with good ideas.